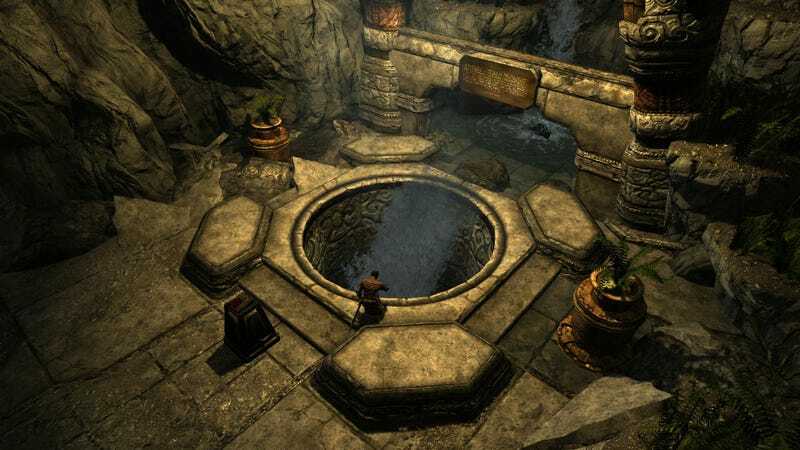 The Forgotten City is a mod available today for the PC and Xbox One versions of Skyrim: Special Edition (and regular ol’ Skyrim). But it wouldn’t have ever been made if its creator, Nick Pearce, hadn’t been randomly punched in the face by a stranger. That was the beginning of Pearce’s writing adventures, and before he began exploring the world of Skyrim mods he maintained a strong attachment to the more traditional forms of literature: forming a book club, reading regularly, and having a crack at an attempted novel. That was several years ago, well before Fallout 4, well before Skyrim. And Bethesda wouldn’t be the ones responsible for the canvas that would later inspire one of the better modders in the Skyrim, and Australian scene: it was Obsidian Entertainment, who had been given the task of crafting Fallout: New Vegas. It’s not hard to see why. The original New Vegas Bounties might have been uploaded the same year New Vegas released, but it wasn’t short of class. 436 lines of freshly-recorded voice were added. Bosses were added as an alternative to fetch quests or logic puzzles. There were balance fixes, too, and it was the first instalment of a series of high-quality mods that continued to be released over the next few years. That begun a journey in 2012 that would span over 1700 hours on Pearce’s part. Like most modders, The Forgotten City came together whenever Pearce had spare time from his day job as a technology lawyer. And that largesse carried over to the design documents as well, with the master sheet totalling 100 pages, along with two-page marketing plan. For a free mod. A lot of work went into the little touches as well. The Forgotten City begins with a note from Cassia, whose brother fell down the shaft representing the entrance to the Forgotten City. You can simply go down the shaft and find him. Alternatively, you can “accidentally” push Cassia down the shaft. And then kill her when she gets pissed at you at the bottom. But perhaps the most intriguing part of it all is the mod’s non-linear structure. You’re not given direct quests with obvious markers and directions. You’re completely free to explore The Forgotten City’s town and piece together what happened that caused this little utopia to collapse. It’s all built on Dwarves’ Law, which effectively holds the city together by threatening to kill everyone if anyone commits a crime. And that’s what ultimately drove the city to extinction: someone in the town broke the law, and it’s your responsibility to find out who. And it’s not like major developers haven’t hired modders before. The creator of the Falskaar mod, which added a new area one third of the size of Skyrim itself and has been downloaded more than 2 million times, was eventually hired by Bungie two years ago. Pearce isn’t walking that path just yet. For now, it’s nice just to see a new fanbase enjoying his creation for the first time. The Forgotten City has already been downloaded more than 1000 times on Xbox One, sitting among the top 10 mods for most popular and most favourited on the platform. And that’s not to mention the combined hundreds of thousands of downloads through ModDB, NexusMods and the Bethesda website. Until then, the future is wide open. This post originally appeared on Kotaku Australia, where Alex Walker is the Editor. You can follow him on Twitter if you’re into that sort of thing.